Under COMPANY DESIGNS, you will find my work for some of the big guys in the industry, The Franklin Mint, Cooperstown Bears, Disney, and one special design for Knickerbocker Co. You may be surprised to find that you own one of these bears and have never known who created the design! I am always happy to sign one of these bears for you at any show. If you provide postage both ways and a completed mailing label, you may send it to me for a signature. "It's my pleasure." In the slide show below, you will see a series of pictures showing the long, complicated design process, necessary to satisfy company design departments and licensers of intellectual properties. The multiple submissions progressed to a finalized prototype, but lacked approval for owner licensing and production. Click into each design page (below) and you will be able to see the conceptual drawings for these designs. The drawing is the first step in creating complicated designs like these, especially for manufacturers. Some of the concepts were first drawn by me, while others were submitted by the companies for me to develop into a 3 dimensional product. I also start with a conceptual drawing to make my portrait bears®. 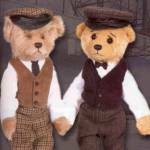 You can see their conceptual designs in the portrait bears® section. to see more company designs.